Over the past few days, I have struggled with loving the way Jesus wants us to. 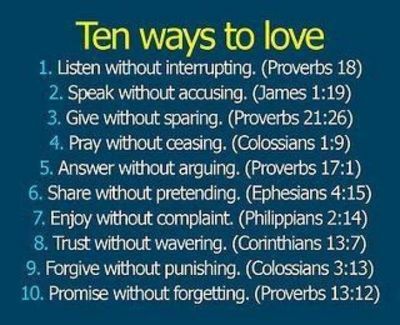 It’s so easy to get caught up in the worlds definition of “love”. What is love? Is it a feeling? Is it an emotion? Is it butterflies in your stomach? I just now looked up the world-famous Websters definition of love…. The first definition is: A strong affection for another arising out of kinship or personal ties. The second one is: An assurance of affection. There are many more, I just don’t have the room to state them all. The list goes on! Love can come in many forms, our first love however should be our father in heaven. Society today has lost that love overall, which is saddening. Every day we are surrounded by material objects, alcohol, television, people, media, food, books, movies, and so much more, all to try to take us away from what our first love should be… Jesus! Romans 12:2 talks about not being conformed to this world, and being transformed by the renewing of our minds… It’s so easy to fall into the worlds trap… The only way we can combat it is… More Jesus, less world. As believers we have to be so careful with what we allow into our minds and spirit. Satan is on the prowl daily, ready to devour anyone who is willing to let them be used. We have to be so careful and guard our hearts, and not let ourselves get robbed of all God has for us. Please don’t take this the wrong way, and think I am suggesting we should all go with out electricity and live in caves.. That is totally NOT my point! My point is we NEED to be aware of what we allow around us. Who we allow to speak into our lives, and what we allow into our hearts, minds, and spirit! We as believers need to be so careful as how we love one another. Romans 12:9(wow, it must be a Romans day or something!) it says, “Let love be without hypocrisy, Abhor(to regard with extreme) what is evil; cling to what is good. Be devoted to one another in brotherly love; give preference to one another in honor.” We need to be different from the world. If not, how can anyone see Jesus through us, working in us? They will just see another human living the worldly love kind of way. Jesus was so much bigger than that! He is sooooo much bigger than that. His love is abundant!! We need to be more like Jesus with our love… I know, I am preaching to myself here! I have a hard time with it, maybe not verbally, but inside my head. Love is patient, love is kind! One thing I have learned is… Sometimes we just need to let go, and learn to let God use us to love. Even when we don’t want to, and that is where His strength, and not our own comes into play!